I am writing to you with concern about someone whom has found a way to illegitimately have all the Teamspeak badges there are. It's really important to stop this from spreading, most of our members are annoyed by this bug and we're receiving more and more complaints about users whom exploit this bug. We (as any server's administration) have the right to disable badges and overwolf's icon in our end. I wrote an AntiBadges Script with PHP Framework. It kicks all players with badges. Given the fact that you can't set them per server, getting kicked for having badges on one server is annoying. Especially just because the admin wasn't able to apply a very easy solution, that will prevent anyone from seeing badges on your server except for yourself. I may not describe this on this forum, but it is really THAT easy. Downside: You can still see your own badges. Anyway, the bug with those many badges should be fixed by TeamSpeak. People are able to get special badges without redeeming codes. Hi, I've seen a recent video on YouTube about being able to get any sort of badge on TeamSpeak. 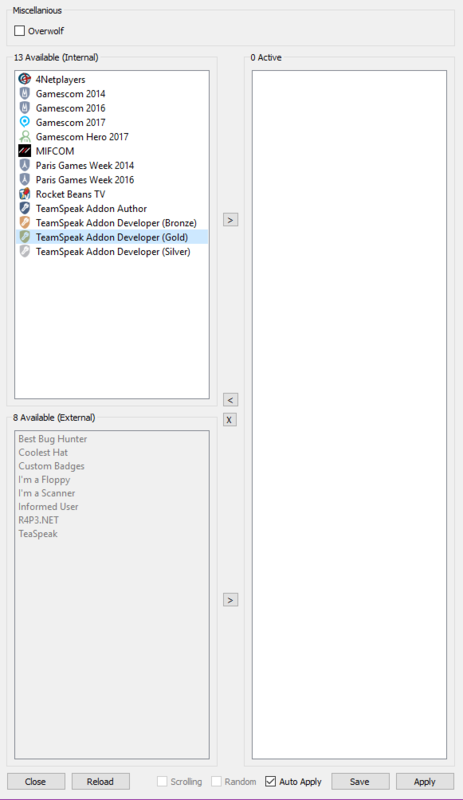 It's a TeamSpeak addon, which allows you to set any TeamSpeak badge onto your current session, up until you restart your TeamSpeak client. They get the TeamSpeak badge ID's from the wiki pages, explanation pages that are setup, and from there they run a command into text chat, which will then apply it to their profile during their session. Upon restart, they lose the icons and will have to repeat the same process. Weren't you the one creating God***** with a even more annoying function that sets random badges every second? Anyway: Why don't you set it to only kick if badges exceed the "official" limit of 3 or unobtainable (addon dev bronze,silver,gold) badges were found? There are even badges wich you can't even get as a normal user (some like addon developer(all 3 types)). We plan to release a second client 3.1.8 beta to fix that more than 3 badges are shown. This client will not fix that badges are shown from users who do not own that badge. This needs a bigger fix. We will post in Thread: [Beta Channel] TeamSpeak 3 Client 3.1.8 when the second beta is released. and what do you mean now, it will fix the limit of 3 badges or peoples cant see those badges anymore? The second beta is not out yet. Only 3 badges + Overwolf Icon can be shown in server tree. That's great again, just bad because the peoples may wont update the client so it wont effect anything. Well I'm talking 'bout the whole Teamspeak Community, not single servers. And I don't think that's going to happen to disable all predecessor versions. But that would be great again. Everyone who will update will not see more than 3 badges on anyone else. You have to relax. They will fix it soon. Teamspeak badges are dead now, none have to fight for it so..